Evergreen content is very important when it comes to SEO. In fact, the majority of your efforts should be focused on this area, as this is where ongoing success is. So, with that in mind, what is evergreen content and how should you prioritise it? For the unitiated, here’s a brief run-down of how you should be handling your evergreen pages. The list goes on. What’s important to note is, as time goes on, these pages are always relevant and in demand. Other pages are not. For example, seasonal guides only spike during the relevant season, while date-specific pages fair even worse. There’s a reason nobody pushes news articles – within a week or two they lose the vast majority of their traffic. When relevant, evergreen content is very powerful. However, relevance is a key issue here. When first created, any piece of content can be assumed to be 100% correct and up to date. Yet, with time, the market, industry or niche may change and you may find your content is incorrect or otherwise out of touch. Don’t create brand new content when you can update your existing one. 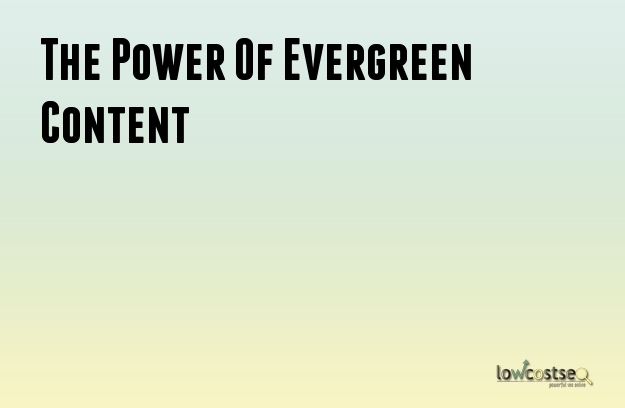 This is where evergreen content proves useful, as you can focus on building strong links and visibility to particular pages. So long as these pages remain up to date, they will always have value. Evergreen content is, ideally, what your link building should focus on. If someone finds your links two or three months from now – yet alone years – is it still relevant? If the answer is “yes”, the links will support your page and drive traffic. If not, you might find you lose links overtime due to webmasters cleaning up their own sites. Similarly, these are the pages you need to develop the strongest backlink profiles and this takes time. Where as decidous content – that which only has a short term impact – has a small window to build links, evergreen content is an ongoing process. Finally, don’t spread yourself too thin. There are only so many links any SEO company can establish at any given time. If you’re trying to push 30 specific pages, this will be harder than pushing for just 10. There’s a reason, for instance, that e-commerce sites rarely build links to individual items. Aside from a shifting, seasonal nature (in the case of some industries, such as clothes), there are simply too many to pick. While you may wish to promote flagship products, restrain your efforts to pushing category pages and other key landing pages. If you want to promote specific products, optimise your website so these products appear prominantly on these pages. Likewise, PPC and other adverts work well for products. For online visibility, it’s all about matching the user’s query and expectations. This also applies to blogs and other continual content. By focusing blogger out reach on only your best content, you don’t clog up your link database or spread your efforts too thinly. It’s better to target your best work and push traffic this way: if people like it, they will read the rest. Don’t worry – you can still share everything else via social media, to an audience that is already interested.